Cub Creek Science Camp is a great place for children to unlock their potential and learn about the world around them. 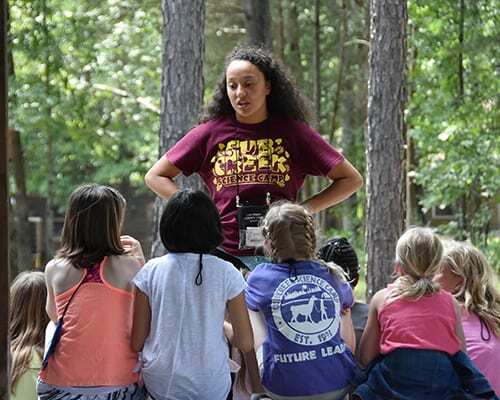 At Cub Creek Science Camp, we help young people learn problem-solving skills, develop positive self-esteem, and enhance their social skills all while having fun! We understand that sending a child to camp for the first time can be scary! It's our hope that the information in this section will help you decide if Cub Creek Science Camp is the right camp for your child and answer any questions you may have about our program. Please feel free to call the office at 573-458-2125 if you have any questions. Please select the appropriate link to be taken directly to your question. Where is Cub Creek Science Camp located? What is Cub Creek's primary focus? Who are Cub Creek's directors? How long has Cub Creek Science Camp been in operation? 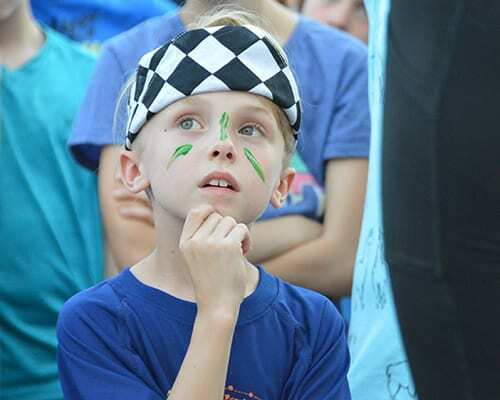 How many campers attend camp during one session? Are campers grouped according to age? Who are your staff members? How do you screen your staff? What is the difference between a course and a class? What if my child does not get into the course or class that he/she wanted? Tell me about the cabins. What will my child need to bring to camp? What type of meals are offered? What if my child has an allergy or dietary restriction? How do I know if my child is ready to go to a sleep away camp? How long should my camper attend? How do I know if Cub Creek Science Camp is right for my child? My child is shy; will she fit in? What options are available for transportation to and from camp? What is available in the camp store? Can I limit my child's purchasing of candy and soda? How do you handle prescription medication at camp? How do you handle over-the-counter medications at camp? My child may need some special help, will this be a problem? Will I be notified if my child is sick or injured at camp? When should I sign up for camp? What forms will I need to fill out? What day and time is check-in? When do I pick my child up on the last day of camp? What type of communication will I have with my child while at camp? Camp is located on Bear River Ranch in Rolla, Missouri. Camp's address is 16795 State Route E, Rolla, Missouri 65401. You can get to camp in a couple ways from anywhere nearby using I-44 and/or Highway 63. For specific directions, click HERE or give us a call! Cub Creek Science Camp started because of a lifelong dream of Lori's to create a fun, educational environment where curious kids can explore and learn about things that interest them, under the guidance of motivating staff. Because animals and science have always been Lori's great interests, she chose to make them the underlying theme of Cub Creek Science Camp. All activities are fueled by science: Our ropes course has applications of physics; culinary has understandings of chemistry; and hikes are tied into botany! Camp is operated and facilitated by a team of Directors year-round. Lori and Scott Martin are the Executive Directors, Founders and Owners of Cub Creek Science Camp. Scott manages the camp facility and Lori oversees the camp program. Anna is camp's Director. She oversees the summer program, manages the camp staff, both in the summer and year-round, and maintains and manages the health and safety of camp's 300 animals! Ari is camp's Assistant Director and Creative Director. She assists Anna in overseeing the camp staff and program, but has a focus on camp activities, photography, the ASIT program, and Animal Camp Jamaica! Our full-time team is rounded out by Anita, camp's Office Assistant. She manages and oversees all office operations, including registrations, camp questions, and camp communications. For full biographies of our camp's full-time employees click HERE! Cub Creek Science Camp has been in operation since 1993. We have been in our current location at Bear River Ranch since 2002. In 2017, camp celebrated its 25th summer! Over the years we have grown into a program that its truly unique in its nature, but remains a camp for everyone! 240 campers come to each session of camp. That includes our teen-leadership campers called ASITs. Cabins are designed to accommodate up to 16 campers and 4 counselors. Each cabin has 8 bunk rooms that two campers share together. All cabins have restrooms and showers inside the cabin, are air-conditioned and have a spacious common room. You can see and read more about our cabins HERE. Yes. Our program is divided into Junior campers and Senior campers. Junior campers are those campers who are 7-11 years and (up through 5th grade); Senior campers are 12-17 years old (finished 6th grade and up). During our activity periods, campers are grouped as Seniors and Juniors. In Cabins, campers are arranged according to their age. We try to have a cabin where the campers are within a year of the same age. While campers eat meals with their cabin, all of camp eats together in our dining hall. We have flexibility in our cabin groupings and will try to honor all cabin requests! Our staff are typically college students, with a love of animals, science, children, and the outdoors. Many of them are education, science, or animal science majors. We also hire former campers of Cub Creek! All camp staff must complete an in-depth application and interview. A clean background check, accurate employment history, and good references are also mandatory. Staff go through two weeks of extensive training prior to the arrival of campers. Training includes going over our camp program, camp’s policies and procedures, and preparations for the unique needs of all children. We cover topics from homesickness to emergency procedures. Two-weeks of staff training is a LONG time, especially in the camp industry. Many camp's offer a maximum of a week of training to their summer camp staff. We even feel like two weeks isn’t enough time to do all the training we want! For this reason, we have online video-training for all camp staff that is completed prior to their arrival at camp. Our activities are what make us stand apart from other camps! At Cub Creek Science Camp, we have a variety of animal related activities for all kinds of animal lovers. Jr. Vet, Adopt an Animal, and Amazing Animals are our three most popular animal activities. Chemistry, Physics, and Pond Study are camp’s most engaged hands-on science courses. But what is summer camp without archery and friendship bracelets?! We offer all of the favorite "traditional" camp activities such as tie-dying, outdoor living skills, archery, fishing, swimming, and crafts. Each night comes to a close with an Evening Activity. These activities include Capture the Flag and camp out. You can dive deep into our camp activities HERE. Courses and classes are the names given to the camp activities that campers choose for their activity periods each day. Each camper will choose two courses for each week at camp and two classes for each day of camp. Courses are activities that campers participate in all week long. If a camper signs up for the chemistry course, for example, each day at the same time she will meet with the chemistry instructors and the same group of campers who also signed up for chemistry. During this course, she will make flubber, create giant bubbles, and make a rainbow in a jar, as well as other fun experiments that will help her understand more about states of matter, compounds, mixtures, etc. Classes are activities that change daily. If a camper did not sign up for the weeklong chemistry course, he would still be able to participate in one or more of our chemistry classes, such as a 1-hour class on flubber or giant bubbles. In our Activity Periods section under Camp Activities, you will note symbols next to the Classes and Courses of camp. These will better help you navigate all the activities our campers can enjoy. Read more HERE When will my child sign up for activities? Campers will sign up for courses and classes when they arrive at camp. On Sunday, during the camp tour, campers will choose two courses for the week and their two classes for Monday. As camp progresses, they choose their classes for the coming day, being able to coordinate with friends and see what interests them! Our most popular courses like Jr. Vet, Adopt an Animal, and Amazing Animals, have no maximum! Each camper is guaranteed to be able to take these courses! We know that many campers come to camp to enjoy these activities so we have designed them to be able to handle a large number of campers, if necessary, while still making it an enjoyable and enriching experience. With some of our other activities, safety or space requires the course to remain capped at a certain number. We try our best to make classes and courses available for all our campers to be able to sign up for what they want. We try our best to get all campers into the classes and courses they came to camp for, adding supervisors or changing the schedule is a possibility when needed. The best advice we can offer is to send your camper with a list of the activities they want to do while at camp and encourage them to speak up if they don't see what they are looking for. We are very proud of our modern cabins. Each 1600 square foot cabin has air-conditioning, private bathrooms and showers, semi-private bedrooms with twin mattresses, a large covered porch, and a central meeting room. While campers spend most of their time away from the cabins, we think it is important that campers are able to get a good night's sleep and have a comfortable area to lounge when not outside. A suggested packing list is located in our Parent Resources drop-down menu. The only items we require all campers and staff to have are closed-toe shoes and a water bottle. Cub Creek will provide all necessary activity equipment and there are no additional fees for activity supplies. Campers are encouraged to bring items that make them feel at home and comfortable, but camp is a technology-free-zone, so cell phones, tablets, computers, and other electronics are not allowed. Our camp store is also well-equipped and has any items of clothing and toiletries campers may need! And in the case your camper is to need anything, you are welcome to send them a package or talk to a member of the management team to help work that out. There is no short answer to what is offered at meals! All of camp's breakfasts, lunches, and dinners are different. In a typical week waffles, pancakes, hash browns, bacon, and eggs would be served for breakfast; hamburgers, cold sandwiches, pasta salad, and chicken nuggets would be served for lunch; and dinner would be anything from spaghetti to chicken wings! All of camp's meals are served buffet style, allowing campers to choose what and how much of what is being offered for that meal. A variety of juices and milk is offered at every meal. There are always alternative options for meals including bagels, cereal, PB&J, ramen, mac and cheese, fresh fruit, and a salad bar. Campers who have a dietary restriction should be aware of their own restrictions and allergies, however, that is no problem for us! We have several options in the case that a camper has any special dietary needs. Parents may send their campers to camp with their meals. In this case, a special refrigerator in the kitchen with access ONLY made by campers with food in that refrigerator, the kitchen staff and lead of the kitchen. This can be anything from special milk, meat, vegetarian/vegan substitutes, etc. Campers also have the option to purchase vegan, vegetarian, gluten-free, and dairy free items from the dining hall's gift shop attached and accessible from the main dining area. In the case that a camper has an allergy to a particular item, camp staff in all and that camper's cabin staff are made aware, and help a camper keep track of any allergens in the meal option. Campers have access to ingredient boxes and can always ask the kitchen staff and directors for clarifications. Lastly, we take special precautions for nut allergies, that includes keeping the peanut butter at ONE location in the dining area. Peanut butter jars never come to a cabin's table or to any other spot than the PB&J table. We, also, do not use communal cleaning rags to clean up any peanut butter as to not spread the oils. Camp has been known to help campers gain independence and learn some soft skills in communication, cooperation, and kindness. All kids can benefit from this! It's hard to say that one indicator is universal for all future campers, but we would suggest just asking your child if he or she is ready! Opening up the conversation at first can be all the answer you need. We don't at all want any camper to be "forced" into camp or a situation that they are not ready for, but we find that while going to sleep-away camp for the first time may be scary, the benefits that our campers walk away with greatly overshadow their initial trepidations. But sometimes the real questions are "How do I know when I am ready to send my child to sleep-away camp?". Sometimes, a parent's own fear keeps a camper from growing here at camp. Try sleepovers, overnight stays at the grandparents or friends, or weekend trips away from home! These may be helpful indicators for how to determine you and your camper's readiness. If you'd like to talk more about your camper's readiness, give us a call! Every camper is different and how long they should attend is entirely up to you. You should base that decision on your family's summer schedule and your camper's readiness for sleep-away camp. However, if the formation of strong friendships is a goal, we recommend at least two weeks. Campers are able to build stronger bonds over the course of two weeks. They are given more time to connect with cabin mates and counselors and feel more comfortable in their surroundings. Two weeks may also be the amount of time that some campers need to feel most comfortable at camp. Program wise, campers are able to participate in more classes and have the chance to retake old courses and try new ones! Evening activities also change up in the second week of camp to include the incredible Floop-a-Flar, a water relay race! If your child is ready for a sleep-away camp and loves animals, exploring nature, adventurous activities, and/or learning about science, then Cub Creek Science Camp will be an excellent fit! We have so many activity options here at camp that every camper can find something they love! The best way to know, is to talk to us about camp! Give us a call or schedule a camp tour! To read more about this you can view our First Time Families page. My child is shy. Will she fit in? Our staff are trained to help ALL campers fit in. The first day of camp is spent learning each other's names, familiarizing everyone with the camp set-up and the week's activities, and breaking the "awkward" ice. Our staff are kind and silly! That alone can help anyone feel less self-conscious and more comfortable! The buddy system is used when moving between activities so no camper is left alone. We have seen even the most shy camper become the one leading all the songs to all of camp on the last day! We try to build and maintain an environment of inclusivity each session to help campers feel a sense of belonging. We offer transportation for all campers flying into camp from St. Louis International Airport. Transportation service between camp and the airport is available starting at $85 for the trip to camp and $100 for the return trip to the airport for departure home. We ask that all campers flying into St Louis to camp make sure they read, understand, and plan for travel according to camp's Transportation Guidelines. To read this, click HERE. For regular campers flights should be scheduled to arrive between 10 am and 1 pm on the first day of camp, and depart between 1 pm and 4 pm on the last day of camp. We must have exact flight information by May 1st; a late fee will be assessed for flight information received after May 1st. Most of our campers are driven to camp by their parents or carpool with a friend. Parents driving for long distances often spend the night in one of our area hotels. Campers staying multiple weeks will do laundry each Saturday. A fee of $5 for each session is deducted from each camper's camp store account to cover the cost of the machines and the laundry detergent. Our staff assists the campers do their laundry, helping empty pockets and sorting laundry. We understand that many campers have never done their laundry before! So we are there to help! The camp store is a favorite place to visit during the afternoon free period. Our camp store is extensive and covers all the bases! We sell essentials like toiletries and personal items, items for entertainment such as coloring books, journals, and playing cards, but also snacks, stuffed animals and apparel! We ask that campers not carry cash or cards at camp. It's unfortunately too easy to lose and keeping track of what's spent is hard with cash. Parents are encouraged to put money on a camper's account in the camp store. This money can be used for all items in the store. Parents typically budget about $25 to $50 per camper week, but of course, we think that parents should provide whatever they wish for their campers! At the end of a camper's session, all monies above $10 are given back to the parents in the form of a check to be picked up on checkout day. All monies under $10 are donated to camp's scholarship fund for future campers to attend camp. We encourage all campers to exercise smart money practices, which is further rewarded with a special bead that campers receive for keeping track of their money! Absolutely! When you put money into your child's camp store account, simply write on the form or tell the staff what limit you would like to place, and this will be entered into the computer at the camp store. We already limit kids to no more than three sugary items per day. This is one of the most frequently asked questions by parents. Safety at camp is our highest concern and priority. We are accredited by the American Camp Association (ACA). In order to be accredited by them, we must meet all the health and safety requirements that they recommend. They even hold a formal and in-depth inspection of our camp every three years! We also must have a record and procedure in place for ALL emergencies, any natural disaster, and any unexpected problem. To read more about what ACA's standards, read HERE. Furthermore, we require all that in order to work at camp, each staff member must be interviewed, screened, and background checked; they also receive two weeks of training before they work with the campers. We stress the importance of the buddy system to staff members and they know to keep up with and account for their campers at ALL times. While camp is in session NO ONE other than camp staff is allowed past the Camp Office. All camp visitors are asked to wait for their campers or friends in the main office. Parents are always welcome to call the office with any questions or concerns. We have a full-time nurse on staff during the summer. She oversees medication distribution at camp along with her assistant. There are four times when campers are given their prescription medication(s): all three meals and before bedtime. According to your camper's needs and what is suggested by your physician, while at camp, your child should take medications at one or more of those designated times. Medications are kept in the health lodge under the watch of the Nurse. She brings only the proper medications to the dining hall to be passed out at meals, and the night medications are passed out in the health lodge. If you have indicated your camper takes medication when registering, camp will send a medical packet which contains small medication envelopes. Parents will fill out the envelopes and pre-package the medicine prior to camp. This will be checked in with the nurse upon arrival to camp. Since your child will be taking medication while at camp, your child’s doctor will need to sign the Health and Medication form. We require a physician's signature to pass any medication, vitamin, or supplement to your child on a scheduled basis. More information about Medications can be found in the Parent Handbook. It is important that you fill out each line of the Health and Consent form and give as much information as possible about your child. In the event of an emergency involving your child at camp, the health form you complete will be given to emergency personnel to help them make treatment decisions. There is a section on the Health and Medication form where the parent indicates which over-the-counter medications are okay and gives permission for the camp to administer them when necessary. If permission is given, the nurse will pass the medication as it needed. The nurse will administer over the counter medicine according to the labeled instructions unless accompanied by a physician’s order. If any over the counter medication is to be administered on a regular basis, a physician’s order should be provided. We are happy to provide reminders, prompts and assistance to insure that campers are able to stay happy, healthy and safe at camp. Staff are trained to assist younger campers in a fun and positive ways, to ensure that they wash their hair, brush their teeth, wear clean clothes, keep their belongings organized, make it to their activities and even with assisting them in making friends. We will be happy to talk to you prior to camp about any concerns you have, or about things we need to be aware of in order to ensure a wonderful camp experience for your child. We do require that campers be able to take care of their own personal needs and make their own dietary choices, but we are happy to provide reminders and assistance with making the right choices. Be sure to give us as much information as possible on your child's camp paperwork and reach out to us by phone with any questions. Yes! Parents will be notified if their child needs medical attention that requires something beyond that which can be administered on-site or if their child spends more than 3 hours in our health lodge. Example: If a camper comes into the health lodge because of a headache and asks to be able to lay down. He or she would be allowed to take a nap. If upon waking, they feel fine and return to normal activities, a parent would not be notified. The nearest hospital is only 10 miles away, and we also have several walk-in clinics that we utilize IF needed, which are also only 10 minutes away. While at camp, if a camper is feeling homesick, we try to keep them very busy and involved with their peers. We have found that being able to keep their mind busy on an activity helps for them to distract their homesick thoughts. In the rare case that the camper is still not adjusting after a few days, our camp director, Anna, will get involved personally. If it is needed, she will call you to share some discuss and make a plan that works for your child, you, and camp. Campers do not call home when they are homesick; In many cases getting on the phone makes them feel worse! Instead, they are encouraged to send emails and write letters. We wish to help every camper overcome their homesickness and help them have a sense of accomplishment after defeating it. As soon as possible! Camp fills and sessions close starting in January! Once your deposit for your chosen week or weeks has been paid, your spot for camp is reserved! If you are considering camp, and you need time to think, we understand. But in the late Winter into Spring session availability will change greatly. If you'd like to Register now, click HERE. Every camper is required to have paperwork on file for them prior to attending camp. This includes a Health and Medication form, Authorization and Consent, Immunization History, proof of Insurance, and (if applicable) Transportation Requests. All of this paperwork is now handled online through our Camp Database software! The drop off time for Cub Creek campers is always on the Sunday of the session between 1:00 pm and 3:00 pm. For ASIT check in, please check the ASIT page. The pickup time is between 9:30 am and 11:00 am on Saturday for all campers, including ASITs. On pickup day, please plan on spending at least 30 minutes touring camp with your child. This is also a great time to take pictures, so don't forget your camera! We will have lunch available for families wishing to stay and picnic. You will be able to communicate with your child through Bunk1, camp's incoming e-mail service, and regular mail, as well as see pictures of daily events in our photo gallery. Mail call is every day at lunch. All e-mails that parents send through Bunk1 will be printed and delivered at mail call, along with any letters and packages that have arrived for the campers. Campers are given the opportunity to send e-mail each day in our computer cafe. Each camper will have a sheet with emails provided to them by their parents of email addresses. They are also able to visit the office to confirm email addresses and ask for others if they do not have them. Parents may view photos posted online by camp on the Bunk1 site, the same site used to send campers emails. Our camp photographers work very hard to capture all moments of camp to provide parents pictures of their campers, but also to help campers remember their time at camp. Information regarding Bunk1 including how to use it and how to log in, will be provided to parents prior to camp and also at camp check-in. Anyone that you give the passcode may email a camper. Only emails sent through Bunk1 will be delivered to campers. In order to access Bunk1 you must have a passcode that will be supplied to you in an e-mail from camp prior to your child's arrival. Due to the large volume of emails received each day, Only those e-mails received through our e-mail service will be printed and distributed during mail call. Using Bunk1 is easy and their customer service is great. Remember, we also post pictures through Bunk1. Above all else, we want parents to use Bunk1's Bunk Note service to assure that only approved people are contacting campers. Bunk1 charges a fee for emails, but not to view pictures. In addition, you can read more about staying in touch with your camper on our Camper Correspondence page. We don't recommend visiting a camper during the week. Many times this can be disruptive to their progression and schedule. However, we will never tell a parent that they can't see their child! Parents who have children staying for multiple weeks are welcome to visit camp on the Saturday or Sunday between a week. If camp is in session, and all campers in camp are staying at camp for the weekend, no visitors may go beyond the camp's office. Parents who are visiting campers should arrive at the office starting at 9 am. They may choose to stay and visit with the camper(s) in the office, or take them to lunch or an activity! We ask that campers be returned to camp prior to evening activity at 7:30 pm. Please set up visits and off-camp trips in advance with our office manager by calling 573-458-2125 or emailing office@bearriverranch.com. Campers must be signed in and out at the office. If camp is not in session, meaning this is a weekend where all campers are leaving at the end of a session, Parents may tour camp with their camper(s) and enjoy a picnic lunch up until 11:30 am.